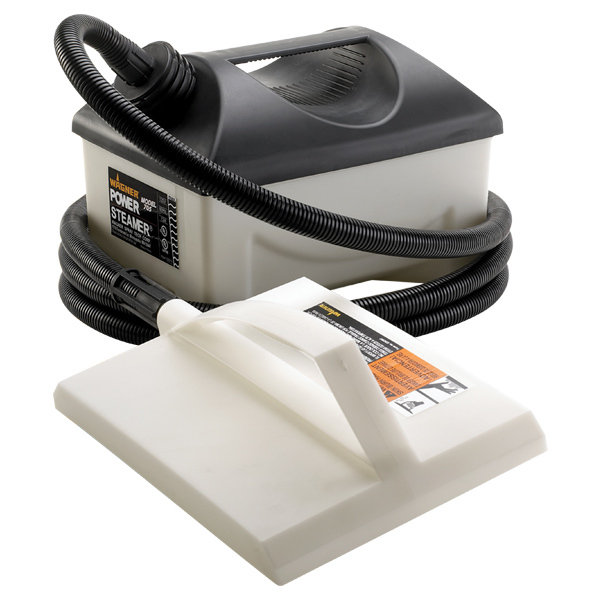 The 705 Power Steamer has a one-gallon tank that provides up to 70 minutes of continuous steam for quick wallpaper removal. 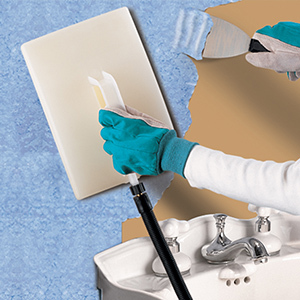 The large 8" x 11" size steamplate allows you to work on large sections of the wall in a single pass. The 11' hose provides increased reach without frequently moving the unit. 705 Power Steamer is rated 4.6 out of 5 by 20. Rated 5 out of 5 by Shawn B from Pro review I own a large painting company, and we remove miles of wallpaper. I rent a commercial steamer at 35per day. My customer said to try her 705 power steamer. I did and wow the only difference I see is the smaller tank size at 1 gallon. This little thing is every bit as good as the large commercial unit I used to rent. I'll be buying one of these this week..Shawn B. Rated 5 out of 5 by Redfield18 from Pretty amazing product I have been using 2 steamers for 2hrs/day for the last two years to steam my horses hay. I am just amazed that this product has been run for that many hours without any issues! Rated 5 out of 5 by Randy1 from Incredible ! I recently purchased a Power Steamer 705. I had always heard the horror stories about removing wall paper so I put it off until my wife laid down the law!! Anyway, I have a background in product development and manufacturing so I'm always looking at a product from a critical eye, from design, price, is it user friendly and of course does it work. So I brought my purchase home from our local Lowe's and went to work. Easy set up-good, written directions- good, watched a you-tube video- very helpful. Machine looked good and felt durable. Now came the moment of truth, will it work! Plugged it in and it was ready to steam within 15 minutes, the attachments were perfect and the wall paper nearly fell off the wall. Total time to do my entire kitchen was around 10 hours and that is for a rookie. I cannot find one negative observation about this fine product. Rarely does a product exceed expectations, but this one has. Very Impressed.... It's a Masterpiece!! Worth twice the price. Rated 5 out of 5 by Kit2 from Ligtweight, easy to use. Used to remove a latex painted stipple ceiling! Not wallpaper! The latex paint quickly softened and peeled off easily. The stipple compound softened and was incredibly easy to remove with a putty knife. Rated 5 out of 5 by RickT from Great product and time saver I needed to remove a border before painting a room. I tried the chemicals (even going to full strength) and all the scoring tools. I was removing about a foot/hour. With some ~ 60-70 feet to remove, I contemplated hiring a pro just to get through the misery. The border must have been of the highest quality as it was nearly impossible to saturate with chemicals. Not to mention the "superglue" adhesive. Wanting to give this one last try, I went to the store and bought a 705 unit. The price was reasonable and any time savings would be worth the price of admission. The removal rate was 10-times faster with less damage to the wall. 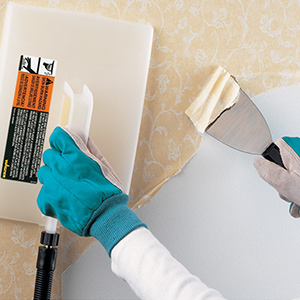 It takes a little practice, but once you get a feel for the amount of time to place the steam tray on the wall, you can really remove lots of paper quickly. Do yourself a favor and get a bucket to hold the steam tray somewhere near you while working. This also keeps water off of everything and minimizes the burn potential. Supplying steam trays in two sizes is outstanding. 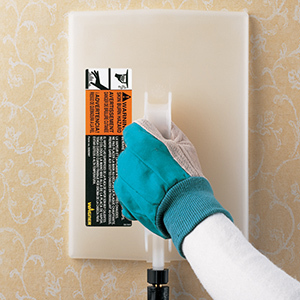 The smaller steam tray is great for removing residual glue and working near edges and ceilings. In summary, if you're going to suffer the anguish of removing wallpaper, then buy the 705. The 705 falls under the category of "money well spent." Rated 4 out of 5 by Remover501 from It was good while it lasted Bought 705 steamer, steamed 2 tanks of water and went for third tank. In the tank there was still water left, but when i went to fill it I tilted unit 90 degrees to get my water from kitchen sink in the unit and when Cold water hit the heating element I guess it bursted some of its plating and element is no longer working. Rated 5 out of 5 by TomOhio from And now, on to other applications Incredible product. I took the paper off my bathroom walls in a short afternoon. I had tried chemical products and peeling it... but the steam took it right off with no damage to the drywall. Now I want to use the steamer for my primary reason for buying it... my wood-bending steam box. Instead of just sticking the hose in a hole and trying to tape the heck out it (which many do), I want to duplicate the male thread from the steam panel on a connection that will allow me to simply screw the hose onto the box. But, I can't find any specs on the thread. How about building one for us woodworkers, so that the unit has a whole new application by design? In the meantime, if I could get the thread specs I'd have on of our techs make one for me. THANKS. Sure you can, we suggest wearing work gloves as the steam and the water at the end of the hose are very hot. For more tips call us at 800-328-8251. I have one of you steamers that didn't come with an operational manual and we cant figure out how to make the steam come out. I emailed a manual to you. Just fill it with water and plug it in. Wait 20 minutes. You can use the steamer for cleaning projects but it only comes with attachments that allow you to remove wallpaper. It does not have other attachments available. If you have further questions feel free to call us at 1-800-328-8251. What is the part on the other side of the flat piece that you put on the wall. I need that part,Can you help me? Any parts you may need are available by calling technical support at 800-328-8251. The only accessories available for the 705 steamer are the large and small steam plates. Feel free to call us at 1-800-328-8251 if you have further questions. How come the cord does not come with it? The Steamer should come with everything needed for operation. A representative will be reaching out to you to go about getting you up and running. Please reach out to our technical support staff at 1(800)328-8251 if you have any questions or need. I think I need to replace the 0-ring that connects hose to unit. Steam is escaping from unit where hose is attached. What is size or spec of the ring? We have all the parts you might need for all Wagner products, just give us a call at 800-328-8251. The steamer stopped in the middle of wallpaper removal. &nbsp;It had been working excellently and then stopped. &nbsp;It was half full of water. &nbsp;I have let it cool, emptied and refilled the steamer. &nbsp;It does not heat. &nbsp;What can be done? Sorry about your trouble with the 705 Power Steamer. If it is no longer heating up there may mineral build up on the heating coils. Our recommendation to clean that up is to mix 8 Oz water and 8 Oz vinegar into the steamer and let it sit unplugged for at least 30 minutes. Then wash it out and plug it in to see if it starts heating again. If that doesn't solve your problem please call our technical support staff at 1(800)328-8251 and they can determine if its in under the 1 year warranty that comes with the purchase of the unit.